Don’t get me wrong, I love cake. It’s just that sometimes I wonder why they get all the love. Frosting, toppers, edible flowers, candles, rainbow insides…….it’s all so pretty! With the holidays fast approaching, I thought I’d see if I could ‘celebrate’ the humble pie, and dress it up a little. 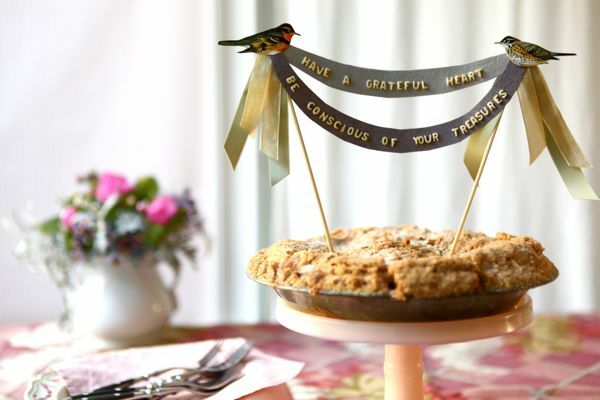 Here are instructions to make a heartfelt Thanksgiving pie topper. 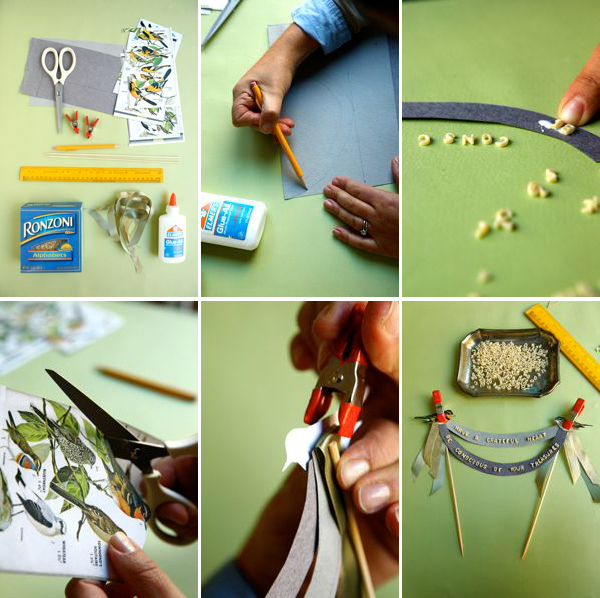 Materials: 4 x 8 inch piece of heavyweight dark gray paper, 2 x 8 inch piece of heavyweight light gray paper, sage green and gray ribbon, 2 wooden skewers, pencil, ruler, white glue, scissors, Alphabet Pasta , print-outs or color copies of bird illustrations (with 1 x 2 inch birds), mini-clamps. Step 1. Begin with your gray paper – draw an upside-down rainbow shape, starting from the top lefthand corner, to the center of the bottom side (marked with a ruler), back up to the top righthand side of the rectangle. Do this on both the dark gray and the light gray paper. You will have one deep rainbow and one shallow rainbow. Cut out a 1 inch strip following your pencil line, with both colored papers. Step 2. Spill out a pile of alphabet pasta into a saucer or tray. Search for your letters and set them aside to glue. I chose to write “Have a Grateful Heart” based on a quote by Seneca who said, “Nothing is more honorable than a grateful heart,” and “Be conscious of your treasures” derived from Thortnon Wilder who said, “We can only be said to be alive in those moments when our hearts are conscious of our treasures.” Really, you could write whatever moves you. Place little dots of white glue on the paper and carefully put your letters into place. You may have to use a pencil tip to nudge them into the right position. Let dry. Step 3. Cut out two bird illustrations. Make sure they are facing each other. I used an old bird guide book I had, but Vintage Printable has a great selection of birds. You may have to resize your images to get the right sized birds. Step 4. Cut two 8-inch lengths of each ribbon, so you have four pieces of ribbon total. Cut your skewers to be roughly 8 inches also. Step 5. 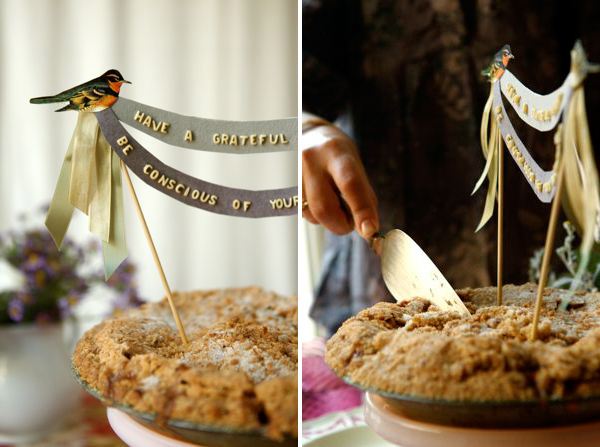 Layer your bird, letter swags, folded ribbons and skewer, in that order. Place glue in between every layer, and clip them together to dry. Be sure to angle your skewers slightly inwards. I left mine to dry overnight, although I don’t think they actually need that much time. Step 6. Bake, or buy, a pie! Insert your topper into your pie and enjoy! P.S. 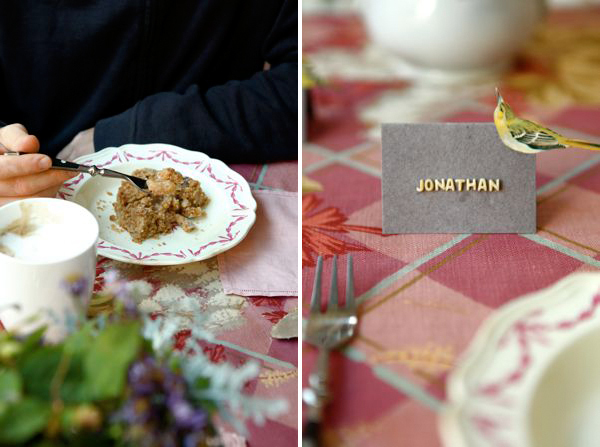 With some leftover alphabet pasta, I made some quick place cards for the table. I see lots of potential with these pasta letters, and there are a about a million in each little box. I’m thinking about gift tags, cards, on top of presents – – what do you think they would be good for? I love this idea! The birds are so sweetly vintage, and you never have to twist my arm to talk me into pie. Great post! 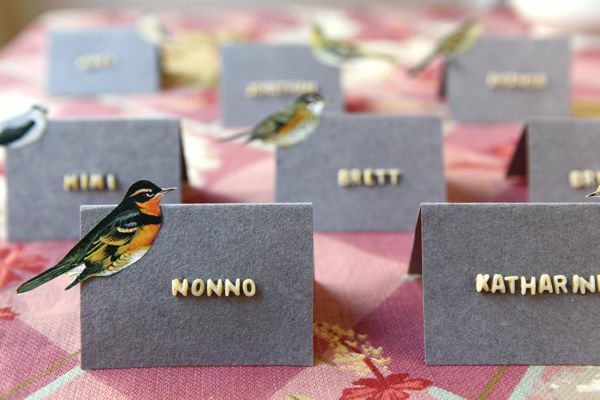 Such a sweet idea – love the placecards! And especially love seeing the Katharine card in the last pic – my 7 year old daughter’s name! She’ll be thrilled – think we’ll be replicating these this year! What a sweet reminder of what we should be remembering at Thanksgiving! And love those alphabet pastas! Gorgeous! I think I would save that and re-use it every Thanksgiving. this is a great idea!! i love this. What a creative idea! Definitely going to try it! This is so awesome! I love how the alphabet pasta is linked to the whole food theme of Thanksgiving. Very clever. This is such a fun great idea. I love it. The photos are beautiful too. great idea using alphabet pasta! LOVE! Sweet touches like this really transform pieces into something special. Beautiful idea and lovely photos! Well done. This is too cute. Thanks for sharing ! Love, love, love this! 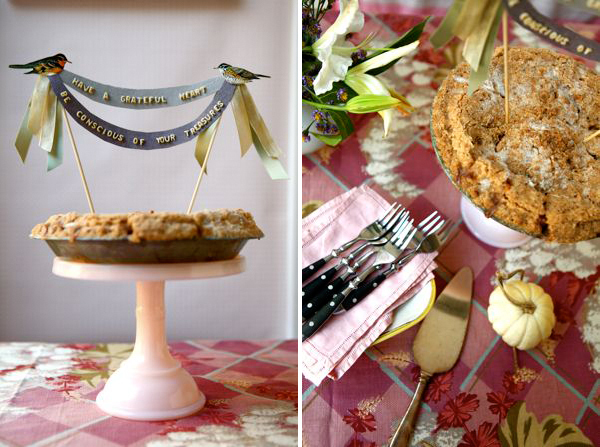 Am going to tweak and use these ideas for our Thanksgiving table. Thanks for creating and sharing! Beautiful!! Such a simple way to dress up my Thanksgiving table! Love the styling!! Eeek, I LOVE the alphabet pasta letters…so obvious and yet genius! These are so cool! I love the banner. I would love to try and make this to go on a cheesecake I’m planning to make for Thanksgiving! Brilliant and Beautiful! Can’t wait to try the notecards myself! I think they are great, i love the pasta idea, will you bring the pie? i’m thinking thanksgiving dessert day! I love the idea, the pictures, and the alphabet letters! hey cool idea! I especially like the alphabet pasta- will look good when sprayed gold. I think it looks lovely, but I am a little concerned about the choking hazard for my young children. Should I boil the alphabet pasta first just to be safe? And is it OK to use blue birds instead of sparrows? Now here is something us uncrafters can do! Thank you – it’s so sweet! We are a pie-loving family, and it’s nice to see pie given its full due. I love the place cards! My daughter and I are stuck in the hospital for the next several months but I we may be to be home for Thanksgiving. We are going to make these a craft since that’s how we pass a lot of our time. Thanks for sharing! I love yout pie banner!! I am pinning the place cards for my children to make them for the Christmas table this year. perfect!! Wow ! These are soooo beautiful! They would totally make any celebration gorgeous and special! I’m a pie lover myself! Love the idea of making a topper for the pie The alphabet pasta is so cute — I saw the pasta letter placecards in Family Fun magazine this month too — such a clever idea. yeah pie is better than cake! cant tell you how many ‘fancy cupcakes’ I’ve had that tasted disgusting. They looked beautiful but the icing was super super sugar sweet and cake dry… bleck! and they are expensive! Looks like a lot of fun! I remember using those alphabet pastas for greeting card when I was a kid! Brings back memory. Thanks! This is such a fun idea for Thanksgiving! I’m in charge of pies this year, might just have to make me one! This is too amazingly cute! You should make a Thanksgiving pinata, too! What a great idea! You always have the most original ideas. Love this so much. Going to have to use the pasta letters for a future project! THANK YOU! This is a great idea, I’m running to the kitchen to check if there is some alphabet pastsa! Thanks for sharing! So pretty! And such a great use of alphabet pasta!! Well this is just a stunner! What a beautiful and dramatic way to announce the serving of the best part of a meal – dessert! This is really charming~ thanks so much for sharing it! So happy to have found your wonderful blog! November Blues « De quelle planète es-tu? Anthology Magazine | Projects | Thanksgiving Decor Tutorial at Oh Happy Day!